BEFOREAFTERWould you like to improve the function and look of your kitchen without the expense of replacing everything?This kitchen remodel is proof that it’s possible. The homeowner was tired of everyone standing in her way while she was cooking. The obstacle was a center island which blocked the work triangle while encouraging people to stand around it. 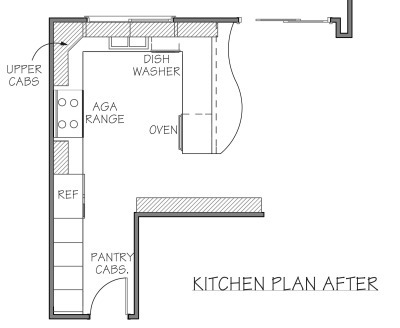 The kitchen floor area was too small to accommodate the “standers” and still be able to move around the kitchen. If chairs were put on the other side of the island, they blocked both the refrigerator and the main pathway between the house and the garage. A new kitchen was in order. 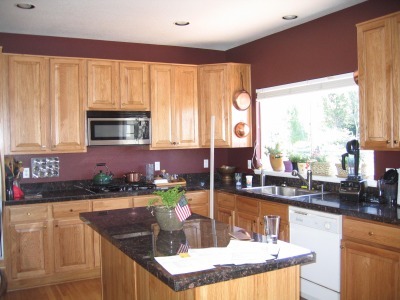 When the owners consulted a kitchen cabinet company they came away with a cabinet layout and costly estimate for new cabinets and countertops, but the problems with the kitchen’s function weren’t addressed. So I was brought in to help them come up with a new kitchen plan using their existing cabinets. 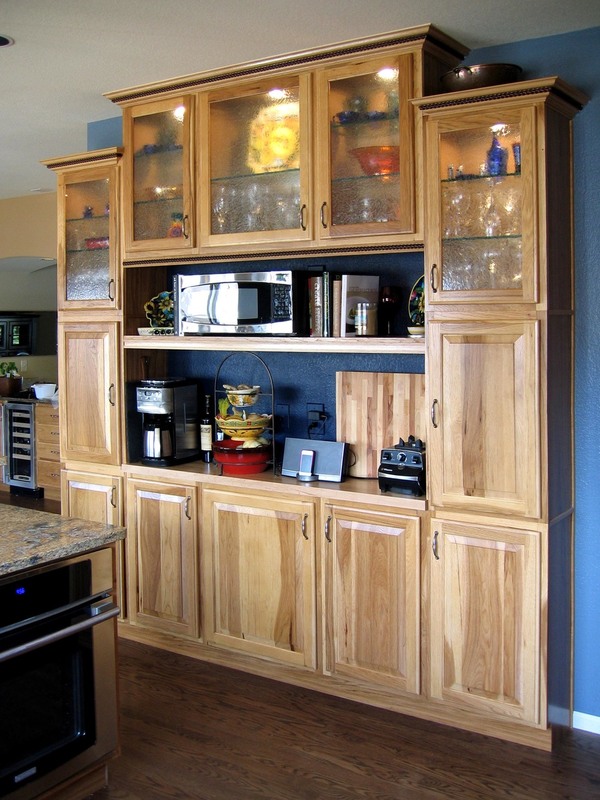 The kitchen had a lot of good quality hickory cabinets that were in excellent condition and we discovered that they could still purchase additional pieces from the same cabinet line. 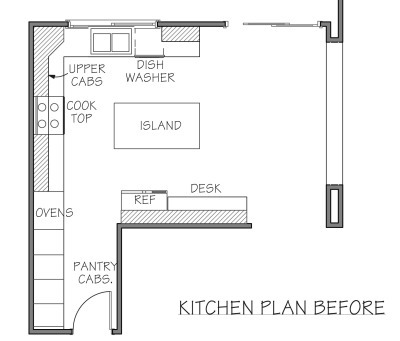 In order to maximize seating, a peninsula was added, forming a U-shaped kitchen. 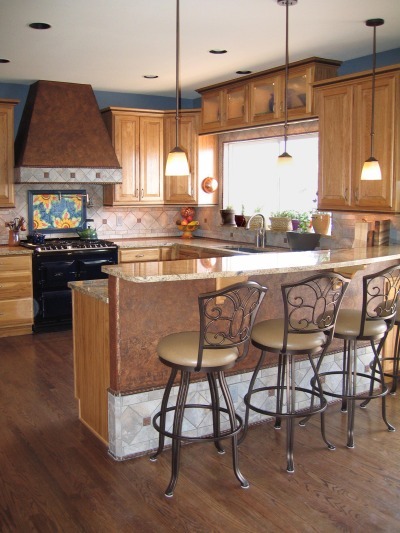 Although island kitchens are very popular, U-shaped kitchens are reportedly the most efficient for the cook. In this case, the “U” formed a work area that was out of the circulation path while allowing bar seating on the other side. 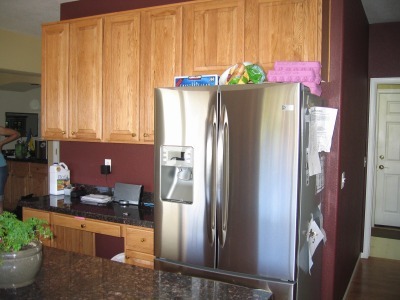 The refrigerator was replaced with a bank of 1’ deep cabinets that provide storage and a place for a small microwave while the new counter depth refrigerator was placed on the exterior wall. An additional under cabinet oven provides extra room for baking while a new midnight blue Aga range replaced the old cooktop Short display cabinets were added above the kitchen window, which had a rather low head height for the 9’ ceiling. The owners did a superb job of picking the color scheme and tile, featuring tiles brought back from Italy over the range. 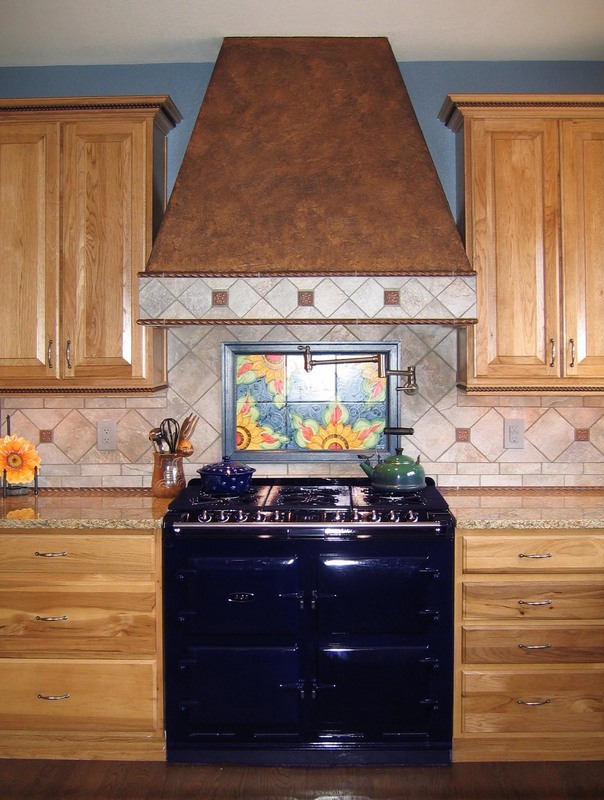 The blue Aga range was the inspiration for the blue walls and accents throughout. 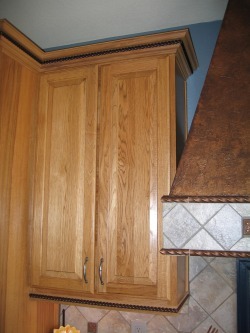 Crown molding and valence were added to the cabinets, with a darker stained rope detail to tie to the floor color. The homeowners also painted the faux copper finish on the hood and bar knee space. A nice blend of warm and cool notes exists between the wood cabinets, copper tones, and blue and grey toned tiles. The owners are very pleased with their new “old” kitchen. They saved a significant amount by reusing most of their existing cabinets while their everyday cooking and especially entertaining has definitely taken a turn for the better!